Finally, after forty-two hours of travel, the kids and I landed in Asia last summer with loads of ministry supplies. Chad met us at the airport excited to see us after our two weeks apart. I got in the front seat of the hired vehicle while Chad and the kids hugged onto each other in 90+ degree temps. Turned towards them, I cringed when I heard Chad yell, “STOP!” The driver slammed on his breaks and somehow missed hitting another car as our driver started to go the wrong way on a one-way street out of the airport. He made the exact same mistake with Chad two weeks earlier. He was fired by our partner at the end of the summer because he couldn’t find any destination with safety! So with whiplash in my neck, I thanked Chad for knowing the way out of the airport better than our professional driver and thus prevented a crash. As the world’s evil seems to intensify, I have found myself asking God time and time again, “Help us live out your kingdom of light in every area. Help us to not line up to any areas to the kingdom of darkness even when it seems to bring temporary peace, stability, and acceptance.” I have found myself scouring the Scriptures looking for God to speak to me about those who live counter-cultural lifestyles. Well, of course, the entire Bible is about those who chose to live counter-cultural and the high price they paid! If we pay a price, we’re in good company! Internationally, I know personal families who lost access to the public village well because they pledged allegiance to Christ. I personally know two teenagers stabbed to death for their faith. I know by name some who underwent unbelievable torture for their faith. I know of a woman raped by her father-in-law every time she left the house to be equipped as a church planter. When we (or other Christians) are about to lead someone to Christ in persecuted areas of the world, we always pedal backwards first. Are you certain you want to do this? Do you know what this could and probably will mean? Are you absolutely certain? We know allegiance to Christ will cost. We in the states are not used to this type of decision making crisis of belief moment when we say, “Yes, Jesus is worth everything I may have to endure for following Him.” It’s been, well, easy for many of us. But, it will not always remain easy for those who want to live counter-cultural lives that line up to Christ and His kingdom. I do believe that some who claim to be Christians in our nation will elude future persecution by simply looking like everyone around them. Already statistics show that many Christians behave, talk, think, give, find entertainment, and make decisions like those who do not claim Christ. But some will choose to follow Christ regardless of comfort, safety, bank accounts, or reputation. And those Christians will pay for it. It’s promised. Satan is not afraid of so-called Christians who look like everyone else. Rather Satan is afraid of those Christians who follow the Messiah and live and die for His glory. Jesus tells his disciples as he predicts his death, “Those who love their life will lose it, while those who hate their life in this world will keep it for eternal life. Whoever serves me must follow me, and where I am, my servant also will be. My Father will honor the one who serves me” (John 12:25-26). So may we not be surprised when we encounter trials because of our faith. It’s been promised. Years ago we took a leading Chinese leader (leads around 19 million people in the underground movement) to another nation. She preached to a large evangelical church that was experiencing little spiritual power because of their fear to take the Gospel out among a religious worldview that surrounded and opposed them. 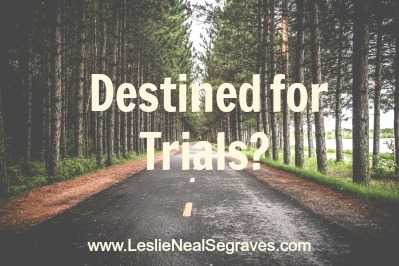 She revealed succinctly the power of knowing your destiny as a Christ-follower. Her freedom came not from her country, but from her simply knowing her eternal destiny. Because she rested in that Truth, she accepted her destiny on earth to experience trials as she lived for the One who provided salvation and transformation. By realizing both her eternal and her earthly destiny, she lived out the power of the Gospel within her circumstances that included persecution.